Plot: A snowplow driver seeks revenge against the drug dealers he thinks killed his son. Based on the 2014 Norwegian film 'In Order of Disappearance'. Starring: Liam Neeson, Laura Dern, Micheál Richardson, Michael Eklund. 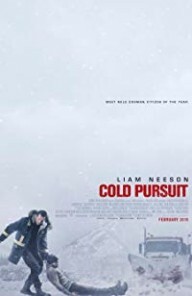 distributed by Lionsgate/Summit «Cold Pursuit» in the US movie theaters released on February 8, 2019 and has grossed over $59 million worldwide; dvd and blu-ray release date was set for May 14, 2019. Rent from Netflix and Redbox from May 14, 2019. «Cold Pursuit» in the UK released in movie theaters on February 22, 2019. DVD and blu-ray release date scheduled for June 24, 2019.